Why is it so difficult for people to associate Nelson Mandela with the ANC? He is the ANC. He was president of the ANC and he was South Africa's first president representing the ANC. How can Cliff Buchler say that Nelson Mandela "helped usher in a violence-free revolution"? (Citizen 25.9.13). Violence free? What planet is Buchler living on? The ANC came to power through violence most savage - necklacing their own people, killing policemen and councilors, and murdering so-called sell-outs in their thousands. On June 3 1990, Nelson Mandela told a press conference after leaving a private clinic that "the only type of violence we accept is organized violence in the form of armed action which is properly controlled and where the targets have been carefully selected". In response to Mandela's call for "targeted" violence, attacks against Black policemen (Mandela's targets) increased from 87 in January 1990 to 886 by 18/5/90. Deaths increased from 1 to 27 in the same period, while homes attacked increased from 45 to 270, and police vehicle attacks went up from 100 to 651. A violence-free revolution? Mandela never foreswore violence - he refused when asked to do so as a condition of his release. Since the ANC took power and has systematically debased, looted and turned this country into a criminal's paradise, we haven't heard one word from this man whom the world has turned into a demi-God [sic]. Has South Africa forgotten its history? Mr. Buchler appears to have done so. 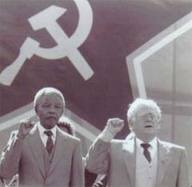 Mandela proven to be a member of the Communist Party after decades of denial. For decades, it was one of the enduring disputes of South Africa's anti-apartheid struggle. Was Nelson Mandela, the leader of the African National Congress, really a secret Communist, as the White-only government of the time alleged? Or, as he claimed during the infamous 1963 trial that saw him jailed for life, was it simply a smear to discredit him in a world riven by Cold War tensions? Now, nearly half a century after the court case that made him the world's best-known prisoner, a new book claims that whatever the wider injustice perpetrated, the apartheid-era prosecutors were indeed right on one question: Mandela was a Communist party member after all. The former South African president, who won the Nobel Peace Prize in 1993, has always denied being a member of the South African branch of the movement, which mounted an armed campaign along with the ANC. But research by a British historian, Professor Stephen Ellis, has unearthed fresh evidence that during his early years as an activist, Mandela did hold senior rank in the South African Communist Party, or SACP. He says Mandela joined the SACP to enlist the help of the Communist superpowers for the ANC's campaign of armed resistance to White rule. His book also provides fresh detail on how the ANC's military wing had bomb-making lessons from the IRA, and intelligence training from the East German Stasi, which it used to carry out brutal interrogations of suspected "spies" at secret prison camps. As evidence of Mandela's Communist party membership, Prof Ellis cites minutes from a secret 1982 SACP meeting, discovered in a collection of private papers at the University of Cape Town, in which a veteran former party member, the late John Pule Motshabi, talks about how Mandela was a party member some two decades before. In the minutes, Motshabi, is quoted as saying: "There was an accusation that we opposed allowing Nelson [Mandela] and Walter (Sisulu, a fellow activist) into the Family (a code word for the party) ... we were not informed because this was arising after the 1950 campaigns (a series of street protests). The recruitment of the two came after." While other SACP members have previously confirmed Mandela's party membership, many of their testimonies were given under duress in police interviews, where they might have sought to implicate him. However, the minutes from the 1982 SACP meeting, said Prof Ellis, offered more reliable proof. "This is written in a closed party meeting so nobody is trying to impress or mislead the public," he said. Although Mandela appears to have joined the SACP more for their political connections than their ideas, his membership could have damaged his standing in the West had it been disclosed while he was still fighting to dismantle apartheid. Africa was a Cold War proxy battleground until the end of the 1980s, and international support for his cause, which included the Free Nelson Mandela campaign in Britain, drew partly on his image as a compromise figure loyal neither to East nor West. "Nelson Mandela's reputation is based both on his ability to overcome personal animosities and to be magnanimous [sic] to all South Africans, White and Black, and that is what impressed the world," said Prof Ellis, a former Amnesty International researcher who is based at the Free University of Amsterdam. "But what this shows is that like any politician, he was prepared to make opportunistic alliances. "I think most people who supported the anti-apartheid movement just didn't want to know that much about his background. Apartheid was seen as a moral issue and that was that. But if real proof had been produced at the time, some might have thought differently." Mandela made his denial of Communist Party membership in the opening statement of his Rivonia trial, when he and nine other ANC leaders were tried for 221 alleged acts of sabotage designed to overthrow the apartheid system. The defendants were also accused of furthering the aims of Communism, a movement that was then illegal in South Africa. Addressing the court, Mandela declared that he had "never been a member of the Communist Party," and that he disagreed with the movement's contempt for Western-style parliamentary democracy. He added: "The suggestion made by the State that the struggle in South Africa is under the influence of foreigners or Communists is wholly incorrect. I have done whatever I did, both as an individual and as a leader of my people, because of my experience in South Africa and my own proudly felt African background, and not because of what any outsider might have said." Mandela joined the ANC in 1944, when its leadership still opposed armed struggle against the apartheid state. However, by the early 1950s he become personally convinced that a guerrilla war was inevitable, a view confirmed by the Sharpeville massacre in March 1960, when police in a Transvaal township opened fire on black demonstrators, killing 69 people. But while other ANC leaders also came round to his way of thinking after Sharpeville, the group still had no access to weaponry or financial support. Instead, says Prof Ellis, Mandela looked for help from the Communists, with whom he already had close contacts due to their shared opposition to apartheid. "He knew and trusted many Communist activists anyway, so it appears he was co-opted straight to the central committee with no probation required," said Prof Ellis. "But it's fair to say he wasn't a real convert, it was just an opportunist thing." In the months after Sharpeville, Communist party members secretly visited Beijing [Peking] and Moscow, where they got assurances of support for their own guerrilla campaign. In conjunction with a number of leading ANC members, they set up a new, nominally independent military organisation, known as Umkhonto we Sizwe or Spear of the Nation. With Mandela as its commander, Umkhonto we Sizwe launched its first attacks on 16 December 1961. Its campaign of "sabotage" and bombings over the subsequent three decades claimed the lives of dozens of civilians, and led to the organisation being classed as a terrorist group by the US. In his book, Professor Ellis, who also authored a publication on the Liberian civil war, elaborates on other murky aspects of the ANC's past. One is that bomb-making experts from the IRA trained the ANC at a secret base in Angola in the late 1970s, a link disclosed last year in the posthumous memoirs of Kader Asmal, a South African politician of Indian extraction who was exiled in Ireland. He was a member of the Irish Anti-Apartheid Movement, which, Prof Mr Ellis says, in turn had close links to the British and South African Communist parties. The IRA tutoring, which was allegedly brokered partly through Sinn Fein leader Gerry Adams, led to the ANC fighters improving their bombing skills considerably, thanks to the expertise of what Mr Ellis describes as "the world's most sophisticated urban guerrilla force". Angola was also the base for "Quatro", a notorious ANC detention centre, where dozens of the movement's own supporters were tortured and sometimes killed as suspected spies by agents from their internal security service, some of whom were "barely teenagers". East German trainers taught the internal security agents that anyone who challenged official ANC dogma should be viewed as a potential spy or traitor. Here are two photos showing the Church Street bombing. As mentioned before, in his so-called book, "Long Walk to Freedom", Mandela says that he "signed off" with this act of terrorism. People should take a look at what Mandela "signed off" with while he was in prison - convicted for other acts of terrorism! President P.W. Botha told Mandela way back in 1985, that he could be a free man as long as he did one thing: Publicly renounce violence. Mandela refused. That is why Mandela remained in prison until the appeaser F.W. de Klerk freed him unconditionally. The bottom line is that Nelson Mandela never publicly renounced violence - and we should never forget that. This is a story about Nelson Mandela, the world-famous "freedom fighter" and "democrat." You'll have to pardon those slightly sardonic quotes, because I'm afraid this is that kind of story: a bit iconoclastic, and likely to provoke howls of outrage from Western liberals who see Mandela as a benign black moderate who led an army of hymn-singing Uncle Toms to the promised land. The technical term for those liberals is "useful idiot," but even I must concede that their intervention was actually quite intelligent, back in the 1950s, when this all started. In those days, good men were weak, and their apartheid adversaries invincible on all but one score: propaganda. The war of perceptions thus became the most critical of all battlefields, with the African National Congress constantly seeking to exaggerate apartheid's evils while portraying itself as "good" in a way that was universally appealing. In the early sixties, Special Branch detectives came upon a piece of evidence that made this a bit tricky in Mandela's case - a handwritten essay titled, "How To Be A Good Communist," in which the leader of the ANC's newly-formed military wing opined that South Africa would become "a land of milk and honey" under Communist rule. We were told that Mandela was innocently toying with Marxist ideas, trying to understand their appeal, but this made little sense. Almost all his co-conspirators were Communists, wedded to a Sovietist doctrine that envisaged a two-phase ending to the SA struggle - a "national democratic revolution," followed by second revolution in which the Marxist-Leninist vanguard took power. If Mandela wasn't in on this plot, it would have been exceptionally stupid of him to participate in it, and Mandela was not stupid. On the other hand, he had to be very careful what he said on this score. The ANC needed the support of Western liberals, and by l964, those folks had come to realize that Communist revolutions inevitably led to the outcome satirized in George Orwell's Animal Farm - a dictatorship of pigs who hogged the best things for themselves, impoverished the proletariat and murdered or imprisoned dissenters by the million. In such a climate, one didn't want to focus attention on that hand-written "milk and honey" essay. On the contrary: one wanted the world to see Mandela as a democrat, willing to die for values that Westerners held sacred. Toward this end, Mandela and his lawyers (with a bit of help from British journalist Anthony Sampson) crafted a masterful speech for Mandela to deliver from the dock during the Rivonia trial. "The ideological creed of the ANC is, and always has been, the creed of African nationalism," he said. "It is true that there has been close cooperation between the ANC and the Communist Party. But cooperation in this case is merely proof of a common goal - the removal of white supremacy." Mandela went to describe himself as a democrat in the classic Western sense, and a fervent admirer of the British and American systems of governance. "Africans just want a share in the whole of South Africa," he said. "Above all, we want equal political rights, because without them our disabilities will be permanent...It is an ideal which I hope to live for and to achieve. But if needs be, it is an ideal for which I am prepared to die." These words rang out around the world, and still echo today. Type Mandela's name into Google, and you come upon millions of essays, articles and book-length hagiographies depicting Madiba in exactly the way he presented himself in that speech: a black liberal, driven to take up arms by a white supremacist state that seemed utterly impermeable to calls for dialogue. The Rivonia statement has become the foundational text of a semi-religious movement that seeks to canonize Mandela as the 20th century's greatest proponent of freedom and democracy. Or perhaps I should say, "bourgeois democracy," in order to distinguish between democracy of the sort practiced in Britain and America and the diseased parody encountered in Marxist-Leninist police states. Nelson Mandela never stood for that sort of democracy. It takes a brave man to address that question, and lo, one such has emerged. Professor Stephen Ellis heads the African Studies Centre at the University of Leiden, and holds the Desmond Tutu chair of social sciences at the Vrije University of Amsterdam. He is also one of the great authorities on the ANC, author of Comrades Against Apartheid and a former editor of Africa Confidential, a magazine valued for its authoritative gossip about what was really going inside the anti-apartheid movement in the l980s. Now Ellis has published a study that sheds startling new light on Mandela's early political career and the circumstances under which he launched his armed struggle against apartheid. The study contains at least one revelation that can only be described as a bombshell -- Mandela was, at least for a time, secretly a member of South Africa's Communist Party. The strange thing about Ellis's bombshell is that South Africans appear to be deaf to its detonation. I know this because I started hyping it to fellow journalists the instant it appeared in print. To a man (or woman) they all shrugged and said, "So what? It's not really a story." This tells us something interesting about South Africans: we are at once riven with ideological obsessions and hopelessly ideologically naïve. The blame for this rests largely on our charming and literate Communists, who go to great pains in their memoirs to disguise the true nature of their beliefs. They tell us that they stood for fairness, justice, and racial equality, and against all forms of exploitation and oppression. They'd also like us to believe that their party was outlawed in l950 because they treated blacks as friends and wanted them to enjoy the franchise. Well, yes. I suppose this was a factor, but the overriding consideration that led to the SACP's banning was something else entirely. At the Yalta Conference of l945, Soviet dictator Josef Stalin assured the Western powers that all the countries his forces occupied at the end of World War 2 would be allowed to determine their own destinies via free elections. With his international image in mind, Stalin instructed commissars in the occupied territories to observe the outward forms of "bourgeois democracy." Towards this end, liberals and social democrats were lured into broad fronts in which all key decisions were secretly made by tiny Communist minorities, with the backing of the Soviet's secret police apparatus. These Communist conspirators then staged spurious elections that brought Soviet puppet regimes to power throughout Eastern Europe, usually with majorities implausibly close to 100 percent. Historians concede that Tito of Yugoslavia was genuinely popular, but elsewhere, the rule of Soviet proxies was imposed by deceit and enforced by tyranny. Tens of thousands of class enemies were executed, millions imprisoned, all vestiges of freedom eradicated. The problem with Communist parties, including the South African one, is that they blindly supported this Soviet outrage, and seemed intent on pulling similar moves everywhere. If Joe Slovo and Rusty Bernstein were still alive, they'd stoutly deny such charges, but they'd be lying. We know this because Rusty's wife Hilda lived long enough to acquire a shrewd understanding of herself and the Communist movement of which she was a life-long part. "Joe and Rusty were hardline Stalinists," she said in a 2004 interview. "Anything the Soviets did was right. They were very, very pro-Soviet." It is important to note that Mrs. Bernstein was by no means suggesting that her husband or Joe were evil men. On the contrary: they were religious zealots who genuinely believed that the Soviets had discovered the cure for all human misery. "I've often thought about this," she said. "They wanted something bigger than themselves, something to believe in. People are always seeking for the meaning of life and if you're not religious, what is it? To us, working together in a movement that had rules and attitudes and comradeship gave important meaning to our lives." In short, being a Communist was much like being a Christian. One studied the sacred texts of Marx and Engels, engaged in polemics as a form of prayer and ruthlessly suppressed all doubts, including one's own. Mrs. Bernstein says she was adept at this until l956, when Kruschev revealed the appalling extent of his predecessor Stalin's atrocities (he murdered around 16 million people, either by having them shot for thought crimes or starving them to death with mad policies). Her husband dismissed these reports as "lies and capitalist propaganda," but Hilda's bones told her it was all true. "We had a fight," she said, "a battle that went on into the small hours of the morning. I wanted to leave, but we had three dependent children, and there wasn't any possible way in which we could have separated economically and so on. So we stayed together, and I accommodated myself by refusing to talk about it any more." And so it came to pass that Hilda Bernstein, the secret doubter, had a ringside seat for the epochal events of the late fifties and early sixties, a time when her husband Rusty was one of South Africa's most senior Communists, and one of Mandela's closest allies moreover. It was in this capacity that she learned of Madiba's secret membership in the Communist sect. "Mandela denies that he was ever a member of the party," she said, "but I can tell you that he was a member of the party for a period." When this interview appeared on the website of the O'Malley archive, it caused a brief frisson among old Cold Warriors, especially when former SACP central committee member Brian Bunting verified Hilda's account. The interview also caught the eye of the aforementioned Professor Ellis, a lifelong student of the byzantine inner workings of SACP. He notes that the SACP of the early sixties was of necessity a pathologically secretive organization, a network of cells with little or no knowledge of each other and no official membership records. "SACP members were formally required to keep their membership secret," says Ellis. "In principle, only the members of each four or five-person cell knew each other. One person reported to the next higher level, and so on. But there was also a special category of ultra-secret members who were not required to join a cell and whom even very senior party members might not know about." With this in mind, Ellis proceeded very cautiously before publishing anything about Mandela's apparent role in the Communist conspiracy. One item in his files was an old police report claiming that two arrested Communists had identified Mandela as an SACP member. A similar admission appeared in the minutes of a 1982 SACP meeting. The final breakthrough came when Russian researcher Irina Filitova interviewed veteran conspirator Joe Matthews, who confirmed that Mandela served on the party's innermost central committee alongside him. "In the light of this evidence," Ellis concludes, "it seems most likely that Nelson Mandela joined the party in the late l950s or in 1960, and that he was co-opted onto the Central Committee in the latter year, the same year as Joe Matthews." Even as I write this I sense that I am losing the average South African. I can almost see you shrugging and saying, "So? This still isn't a story." But it is a story, and here's why: if Ellis's evidence is correct, the fatal decision to launch a war against apartheid had nothing to do with the ANC. It was a decision taken unilaterally by the Communist Party, and then imposed on ANC president Albert Luthuli by a prominent African nationalist who was secretly a member of the Communist underground. His name: Nelson Mandela. It seems fair to say that black South Africans have entertained thoughts of armed revolt since the day Jan van Riebeeck landed in Table Bay. It is therefore clear, as Ellis stresses in his landmark paper, that no political party held a patent on the term armed struggle. The Pan-Africanist Congress was dead keen on it, and elements in the ANC thought it was inevitable from the early fifties onwards. The difference between those organizations and the Communist Party is that peaceful change via the ballot box was never really on the Communist agenda, because that sort of change invariably left the capitalist edifice standing. "Classes do not commit suicide," said Joe Slovo, a dutiful acolyte of Vladimir Lenin. Enemies of the working class had to be undermined, subverted, and conclusively defeated before the socialist millennium could begin. There was a time when this socialist millennium did not seem particularly attractive to South Africa's so-called "bourgeois nationalists," Marxist code for Africans who would have been perfectly happy to defeat the Boers in a bourgeois democratic election and then help themselves to a fairer share of the nation's riches. Communists did not approve of "bourgeois nationalists," and vice versa, which is one reason why Nelson Mandela spent the l940s breaking up Communist rallies with his fists. In the early fifties, however, the SACP realized that cooperating with the nationalists was likely to hasten the fall of the Boers, thus creating conditions conducive to a more rapid advance towards true socialism. At more or less the same time, nationalists like Mandela realized that the Communists could bring several desirables to the party. Around half of them were white. They had cars, houses, telephones, organizational skills and access to funding. Soon, Communists were supporting the ANC's legal campaigns and recruiting ANC members into their own underground party. As Ellis observes, this strategy did not enjoy the approval of the high priests of Marxist-Leninist revolutionary science, who were located in Moscow. It was a home-grown initiative, devised as a means of amplifying the influence of a tiny body of true believers. (At the time, the SACP had barely 500 members.) The SACP was thus delighted to discover, at a 1960 conference in Moscow, that these high priests were now thinking along similar lines. The imperial powers were pulling out of Africa, and alliances with previously detestable nationalists provided a way for tiny bands of Communist intellectuals to stay in the game, and perhaps wind up in control of a few key ex-colonies. Out of this emerged the SACP's new revolutionary doctrine, which has always reminded me of the hoary old fable in which a scorpion convinces a frog to carry it across a river. The frog (or bourgeois nationalist) does all the work, staging a "democratic national revolution" that topples the imperial or colonial power. The scorpion (representing the Communist cause) goes along for the ride, only to sting the frog to death just as it reaches the far bank. The punchline of the original remains entirely apposite: scorpions do such things because that is their nature. Something else happened in l960, something very important. The catalyst was the PAC, a movement of hardline African nationalists who'd broken away from the ANC the previous year on the grounds that it was "dominated by white Communists" whose ultimate loyalties were open to question (see above). In April, l960, the PAC staged a nationwide protest against the hated pass laws. 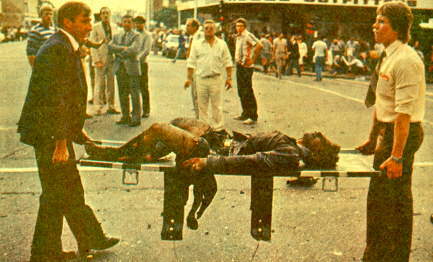 In Sharpeville, police opened fire on a crowd of PAC supporters, killing an estimated 69. The resulting outburst of rage shook the apartheid government to its core, and led to the outright banning of both the PAC and ANC. From afar, it seemed that the mood in South Africa had at last turned revolutionary, which is presumably why Joe Matthews and Michael Harmel of the SACP were given a stellar reception when they turned up in Beijing a few months later to canvass support for armed struggle. According to Ellis, the Chinese had previously been sceptical of such plans, but now, the SACP delegates were considered so important that Chairman Mao himself took time to meet them. They were accorded a similar honour in Moscow, where they apparently stayed in Stalin's former dacha while conducting top-secret talks with senior Soviet officials. The precise outcome of these discussions remains uncertain, but Ellis presumes that Matthews and Harmel came away with pledges of support, because the SACP now moved swiftly forward, adopting a policy of armed struggle at a conference in Johannesburg "towards the end of 1960." It now became necessary for the SACP to convince the ANC to join its initiative. White Communists couldn't act in this regard, because they weren't allowed to join the racially exclusive ANC or take part in its deliberations. The task thus fell to black ANC leaders who wore two hats - which is to say, were members of both the ANC and the SACP. In some cases, this joint ANC-SACP affiliation was open and well-known, at least to those in the underground. In others, it was secret. The most important of these secret members was the charismatic Nelson Mandela. On the day the SACP took its fateful decision, Mandela was a defendant in the Treason Trial, a marathon affair that had been dragging on since l956. The rest of South Africa was extremely tense, but inside Judge Rumpff's courtroom, the atmosphere was oddly congenial, considering that Mandela and his co-accused were on trial for high treason, and that the three judges were officials of a white supremacist regime that Mandela frequently characterized as "Nazi." In theory, the gap between the white judges and the mostly black accused was unbridgeable, but these men had been staring at one another across the courtroom for years, sparring, joking, taking each other's measure and acquiring a measure of mutual respect. All the accused were out on bail, but when they were re-detained during the post-Sharpeville State of Emergency, Judge Bekker's wife came to their aid, running errands on their behalf and carrying messages to their families. Judge Kennedy was so impressed by the pro-ANC testimony of Professor ZK Matthews that he came down from the bench and shook Matthews' hand, saying, "I hope we meet again under better circumstances." Judge Rumpff was a grumpy old Afrikaner and a reputed Broederbonder, but even he seemed to be softening. On March 23, l961, Rumpff took the unprecedented step of interrupting the defence's closing argument, saying, in effect, we don't really need to hear this. Some of the accused took this to mean that the judges had decided to disregard the evidence and hang them - the predictable totalitarian outcome. They were wrong. A week later, Rumpff asked the accused to rise, and pronounced every one of them innocent. This was a dumbfounding outcome, given the enormous resources the apartheid state had devoted to the treason case. Prime Minister Hendrik Verwoerd was in the habit of telling the world that most blacks supported the principle of separate development, and that only a handful of misguided troublemakers opposed it. Rumpff's judgement annihilated that argument. In rejecting the state's case, he had in effect ruled that the ANC's cause was just, its grievances legitimate, and its strategy of non-violent defiance acceptable in the eyes of reasonable men. This outcome hugely strengthened the hand of ANC president Albert Luthuli, a devout Christian who continued to believe that peaceful change was possible in South Africa. After the Sharpeville shootings, his stance was bitterly criticized by ANC radicals, who thought the time for talking was over. Rumpff's verdict suggested otherwise. It showed that South Africa was still a land of law, with judges willing to hand down decisions that infuriated the ruling party. South Africa also had a relatively free press, a vigorous democracy (albeit for whites only) and, as Mandela acknowledges in Long Walk To Freedom, a police force that still conformed to British norms, with due process respected and torture at this stage unheard-of. Some observers saw Rumpff's verdict as a watershed of sorts, a development that could easily have led to further liberalization. Nelson Mandela was totally disinterested. In Long Walk To Freedom, he writes that he went underground within hours of Rumpff's verdict. Officially, his mission was to organize popular support for a national convention, but Ellis thinks this unlikely. "A close analysis of the campaign for a national convention concludes that this initiative was primarily intended to provide proponents of armed struggle with a paper trail that would justify their forthcoming change of policy," he writes. In other words, the SACP was angling to regain the moral high ground. It knew that the verdict had come as a surprise to international observers, who were left wondering if Verwoerd's regime was indeed as evil as it was held to be. But the SACP also knew that Verwoerd could be relied on to reject any call for a national convention, thus restoring his reputation as an intransigent racist. As Ellis notes, this would allow the party to present the coming declaration of war "in the best possible light for public and international consumption." The second leg of Mandela's underground mission was of course to convince ANC president Albert Luthuli to follow the lead the Communists had taken. Luthuli was not a pacifist per se, but he believed that non-violent options remained viable. Like many others in the ANC and even the SACP, he also believed it would be folly of the highest order to take up arms at a point when the ANC was still struggling to organize effective protests. Luthuli and Mandela had it out in June l961, at a tumultuous meeting of the ANC's national executive in Tongaat, Natal. The debate raged through the night, but when the sun rose, Mandela was triumphant; the ANC had authorized him to launch Umkhonto we Sizwe, and to start making preparations for war against the apartheid state. This is Mandela's version - or more accurately, one of his versions. In Long Walk, he acknowledges that the outcome of his clash with Luthuli was actually very messy. "The policy of the ANC would still be that of non-violence," he writes, and the new military organization was required to be "entirely separate from the ANC." Luthuli himself remained committed to non-violence until his death six years later. Reading between the lines, Mandela seems to be suggesting that Luthuli was willing to turn a blind eye to his military adventure, provided it did not damage the mother organization. Durban Communist Rowley Arenstein rejected this out hand. "Luthuli was simply brushed aside," he said. "Adoption of armed struggle by the ANC was the act of a Johannesburg SACP clique, a hijacking." Arenstein was subsequently purged from the party. Mandela returned to Johannesburg to plan his sabotage campaign, heedless of the counsel of men with clearer heads. "If you throw a stone into the window of a man's house," said SACP general secretary Moses Kotane, "you must be prepared for him to come out and chase you. The backlash will be fantastic. The police will go mad." The first MK bombs went off on December 16, 1961. The rest is history. 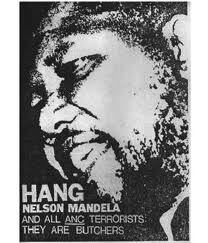 Poster distributed by the Federation of Conservative Students (the official Conservative Party student organisation) in Britain during the early 1980's, clearly illustrating that people overseas were more aware of the evil nature of Mandela and his fellow ANC terrorists than most people in South Africa were. South Africa's "Truth and Reconciliation Commission" - ostensibly set up to cleanse that nation's psyche of its tortured past - is finding that the Marxist revolution fought there between 1948 and 1994 witnessed a departure from the normal rules of war by both the communist African National Congress and the Christian, pro-West NP government. The TRC's official goal is to investigate crimes committed by both the Marxist ANC and the right-wing government during the “apartheid era”. Crimes committed by other groups, including the Inkatha Freedom Party, are also being investigated. If those charged with crimes promise to tell all they know to the commission, they can be granted amnesty. Under ongoing hearings before the “Truth and Reconciliation Commission”, the sordid and often macabre blood sport that characterized this war has been leaking out in dribs and drabs to a global audience. Most of those appearing before the TRC can apply for amnesty and escape prosecution if they admit their guilt. Many have chosen this route and testified against either the Afrikaner leadership or the ANC. Others, like Winnie Mandela (ex-wife of Nelson Mandela) and former South African President P.W. Botha, have maintained their innocence to the very end. The ANC at first denounced a parliamentary bill granting amnesty for those who request it from the “Truth and Reconciliation Commission”. The feeling among the ANC was that it would provide a blanket amnesty for the torture and killings conducted by the right. However, as more and more of the ANC's misdeeds are exposed, some have concluded that the Marxist organization is also in need of blanket amnesty. The misdeeds of the Soviet-sponsored ANC have been well chronicled. It operated under and parallel to the South African Communist Party, established in the early 1920s as the first Communist Party outside the Soviet Union. In fact, the party was set up under the slogan "Workers of the world unite and fight for a White South Africa". Throughout the Cold War, the Soviets provided training and advisors to the ANC. The Soviet Union sent troops and billions of dollars in arms to fight a war in Angola. This was a part of the Brezhnev Doctrine to "seize the strategic mineral treasure chest of Southern Africa and deny these materials to the Western military-industrial complex." These minerals included titanium, used to build fighter jets, and zirconium oxide, a rare commodity used to sheathe nuclear reactor fuel. The crimes committed by the ANC in the name of liberation are legion. First, there was the practice of "necklacing," in which a petrol-filled tyre is placed around the neck of a victim and set ablaze - an action carried out by Winnie Mandela and her minions. Another horror was the "Church Street Massacre," in which Nelson Mandela approved of a bomb set to explode at rush hour to maximize casualties of Afrikaner women, children and babies. The same Mandela who told the Black youth of South Africa to "burn down" their schools has produced a lawless, unemployable generation. Mandela recently travelled to Libya and presented Gaddafi with South Africa's highest military medal. abuse was widespread and far-reaching. Torture and murder occurred not only in Angola, but also in ANC re-education camps in Uganda and Tanzania. This report was a major embarrassment to the ANC, which had been lionized in the West for its war to end apartheid and install a supposedly democratic government in South Africa. Detainees recounted in the report that they were tortured for disagreeing with Marxist orthodoxy, refusing to carry out bombings of civilians, being accused of spying, questioning ANC policy, or trying to leave the organization altogether. Even the late Joe Slovo, a Lithuanian-born KGB colonel and the main leader of the South African Communist Party through the 1980s and early 1990s, said before his death that "it is possible that people died" in the re-education camps. The report reads in part:: "The worst conditions were at the Quatro camp in Angola, where guards and medical assistants were universally hostile. The inmates, whether convicted of any offence or not, were denigrated, humiliated and abused, often with staggering brutality. Prisoners were forced to crawl through piles of red ants, thrown down into trenches and then made to crawl out while guards poured dirt into the hole. Others were denied food, water and medical treatment. One prisoner had boiling water poured on his head. His head was then regularly struck against a tree to prevent healing. Prisoners were beaten to force confessions. Some prisoners were executed by firing squads for taking part in mutinies, beaten to death for infractions of military discipline or died of malaria and other illnesses in detention. From the late 1970s until 1991, suspected spies were imprisoned for up to eight years without any hearing, tortured to extract confessions, and beaten with sticks and wires." guerrilla training centres. Many of the new recruits were poorly educated, impatient to fight, given to drinking and drugs. Some were secret agents sent by the South African police. Thus the ANC gave its security department, called "Mbokodo" [the Xhosa word for "grinding stone"] unchecked power to investigate, judge and punish recruits." The panel that compiled the report also learned the names of accused torturers, some of whom still hold posts in the ANC's security apparatus. The actual names were withheld from the published report, but are known to the ANC hierarchy. Two ANC leaders were directly named, however: Joe Modise, the former head of the ANC's military wing, and Jacob Zuma, the former ANC secretary general. Neither was accused of torture, however, Modise was cited as being part of a tribunal that in 1981 improperly arrested Dumisani Khosa, a producer for the ANC's underground radio station. Khosa was arrested for "complaining about nepotism and sexual harassment" within the ANC. The report states that Khosa was "beaten until he urinated blood, then shipped to the Quatro camp in Angola where he was held for more than three years." Others implicated in the report are ANC representatives in Zambia and Uganda, as well as one of Mandela's former bodyguards. The evidence in the Rivonia trial was shocking. The prosecutor, Dr. Percy Yutar, wrote the following in the prologue of the book Rivonia, The Mask Off by Laurutz Strydom. He said the aim of Rivonia was to create utter chaos in the Republic of South Africa. Thousands of guerilla fighters would afterwards take action. The masterminds of Rivonia planned a coup and military units outside the Republic would at the right moment start to invade the country. Revolutionaries planned to take over the administration of the country. Dr. Yutar said all the accused admitted that the documents were authentic and their case was therefore submitted in court as a classical example of high treason. The country was at the time heavily sabotaged and terrorists such as McBride murdered innocent people at the Magoo Bar in Durban [during which outrage that great British patriot Keith Hulse was seriously injured, his life being saved by another true hero of our times, Alan Mountford]. A group of young Blacks shot people in the St. James's Church and some planted land mines that killed or maimed innocent people. The communistic world honoured the prisoners of Robben Island, and especially Mandela, as "martyrs" and they received tremendous support and sympathy from these corners. They executed immense pressure on the De Klerk-regime to reach a settlement with the ANC and SACP, and ultimately he capitulated. Propaganda after the Rivonia trial made heroes of traitors and oppressors. Nelson Mandela, South Africa's first Black president, who is widely admired across the political spectrum more for his performance in office than for his beliefs, is now retired and thus free to express his long standing Marxist and often bizarre beliefs freely. He continually attacks U.S. "imperialism" and "arrogance" while voicing support for the likes of Libya, Iraq, and Cuba. This is not surprising. Mandela did support violence in the past - a fact that is largely forgotten or trivialized. Indeed, in 1961 he was the founder of Umkhonto we Siswe ("Spear of the People"), ANC's terrorist arm, and never during his long years in prison did he condemn that organization's acts of indiscriminate terrorism. Moreover, throughout his career Mandela has remained close to regimes actively supporting terrorism - the former Soviet Union, Libya and Cuba. There were good reasons for such fears, not the least being the decades old cohabitation of Mandela's African National Congress (ANC) with, and its penetration by, the Communist Party of South Africa (SACP), one of the world's most committed Stalinist parties. There were also the ANC's close links with the militantly leftist (and SACP dominated) trade union federation, COSATU. Importantly, despite the rhetoric about Black economic oppression under apartheid, the fact remains that a Black middle and indeed upper class had developed in South Africa, the interests of which had little to do with the traditional socialism advocated by the ANC throughout its history. Mandela implemented an aggressive affirmative action policy once he took office - which slowed down the economy. His government established a criminal law code on the European model - abolition of the death penalty, excessive rights for accused criminals, etc., with destructive results. South Africa today competes with civil war-torn Colombia for the dubious distinction of being the world's most crime-ridden country. Interpol's International Crime Statistics say it all: in 1999 South Africa had 121 murders and 119 rapes per 100,000 inhabitants, compared with Colombia's 69 and 6 respectively (and the United States' 5 and 32). The trends are no more encouraging considering that in 1994 the world's average murder rate was 5.5 per 100,000, compared to South Africa's 45. In such circumstances, and with a slow justice system, which only produces a 10 percent conviction rate, South Africa has seen the rise of vigilante groups filling the void left by an incompetent (affirmative action, again - one third of policemen are functionally illiterate) and violent police - who between 1997 and 2000 killed 1,550 people, compared with 2,700 killed by the apartheid regime in 30 years. The high crime rates, and a decline in educational standards, led to a massive emigration of White professionals to the United States, UK, Canada, and Australia. A 1998 poll of 11,000 skilled professionals suggested that 74 percent wanted to emigrate - with then-president Mandela responding with "Good riddance" to them. The problem is that not just professionals leave South Africa - major corporations also moved out, including mining giant Anglo American Co. and South African Breweries, both of which are now headquartered in London. When it comes to African opinions at the UN, Pretoria prefers to side with the worst. Libya for chairmanship of the UN Human Rights Commission? Yes, said Pretoria, and so did the rest of the African bloc. Support Mugabe's "right" to be invited to Lisbon for the EU-African Summit? Yes again, at the cost of billions of dollars in aid to Africa. Mandela's ideological legacy seems to be alive in Pretoria's international behavior. None of this should come as a surprise. The once dominant South African National Defense Force (SANDF) is now only a shadow of its past self, largely as a result of budget cuts and affirmative action, which put former ANC terrorist thugs and gang members in charge and led to a massive exodus of White and Coloured officers. President Mbeki has a problem with his own ANC party, specifically with Nelson Mandela's former wife, Winnie. Mrs. Mandela is the loose cannon of the ANC. A convicted torturer and felon and thoroughly corrupt, she remains a very popular figure with Black South African youths and was repeatedly elected to the ANC leadership. The disturbing thing here is not so much Winnie's criminality, awful as it is, as the general decline of South Africa's judiciary, which is becoming increasingly more "African" and less and less Western. The Rivonia high treason trial, in which Mandela was one of the accused, is in the news again. According to reports Dr Percy Yutar, who was the prosecutor in the case, is going to sell his documents and books in a public auction. Foreign universities are allegedly very interested. The first reaction is alarm that these very valuable and unique Africana could become lost to South Africans. However, after a little reflection one has to admit that the documents will probably be safer in the library of some foreign university than in South Africa, where the ANC/SACP is trying to wipe out the past by neglect and destruction. Mandela and others were found guilty of high treason in the Rivonia trial. The case was a culmination of the firm and effective actions of the security services and the courts in those days, which brought a long era of political stability and economic prosperity to South Africa. Keeping in mind that the people who were prosecuted then, are now ruling South Africa, it could be meaningful totake note of what the courts findings were. Dr Yutar wrote the following in a prologue to Lauritz Strydom’s book "Rivonia - Masker af! ", and we quote:"I was deeply shocked and could hardly believe what I read in the documents, which either were in their handwriting, or was found in their possession. These documents clearly indicated that the accused purposefully and maliciously planned and effectuated deeds of violence and destruction throughout the country. This was aimed at creating chaos, disorder, and unrest in the Republic of South Africa, which according to their plans, would be aggravated by the actions of thousands of trained guerilla fighter deployed all over the country...... . The combined actions were planned to lead to confusion, violent insurrection and rebellion and malicious destruction, followed up at a suitable opportunity, by an armed invasion of the country by military units from foreign countries. In the midst of the resultant chaos the accused planned to bring about a revolutionary government.... . The accused admitted to the validity of all these documents as well as that their policy included the eventual violent overthrowing of the Government of South Africa. It is for this reason that I presented the court with the fact that this was pre-eminently a case of high treason. Broadly seen these documents supply us with more than enough evidence for every accusation ..... including, (a) the involvement of Moscow, the Communist parties of Algeria, China, Czechoslovakia, East Germany [GDR] and several other countries regarding the provision of monetary help, weapons, ammunition and military personnel. (b) the fact that the African National Congress is totally dominated by the Communist Party and that they consulted altogether less than 1 percent of the total population in South Africa....". So far Dr Yutar. There is much more in the prologue and even more in the book itself, but what we have quoted here depicts a valuable picture of the people to whom the De Klerk government has handed the country in 1994. We hope that Dr Yutar's documents will find a place in a foreign archive where it will be kept safe from malicious destruction. We believe at a suitable time it will be used for research by a postgraduate student and that he will then unmask the ANC/SACP for the whole world to see. - Report sent by the Boernews news service. 1) Concerning Mandela's jail sentence. The crimes he committed were shamelessly criminal, and included no heroic acts. In fact, it is still a mystery why Percy Yutar (the then state attorney) did not file for murder, but manslaughter instead. Based on the facts it is commonly agreed by legal scholars that Mandela would have been hanged if Yutar filed for murder. You can easily get access to the case and you will find facts that the media, for whatever reason, prefer to ignore. 2) They often show Mandela's cell on Robben Island. That is not where he spent most of his time. He later lived in a house under so-called "arrest". It was comfortable if not luxurious, and most people work every day of their lives for the privilege to live in something not nearly as good as that. Why do they never show photographs of that? 3) What is really mind-boggling is the fact that while he was in the "house jail" he had free access, on account of the S.A. tax-payers, to telephone, fax and other communicating facilities to organize the ANC. That is why he was still the leader when he was "released". 4) You already know of the terrible deeds he ordered for his own people who disappointed him. He has many murders of his own on his hands. 5) He was supposedly in "jail" for 20 or more years. One would expect that he had a negligible income in that time. Yet when he and his wife were divorced about 4 years after his "release" he had to pay her millions in settlement. Where did these millions come from? Who else could earn millions in 4 years from a salaried job after taxes? Obviously something is seriously wrong. You find out where all that money came from and you will discover a lot about Mandela that the press never report. 6) Once he left "jail" (the house the government provided) he moved into a very luxurious home in one of the richest suburbs of Johannesburg. However, he kept a little four-room house in Soweto and pretended to live there. That is where he would interview reporters and where photographs were taken. What a liar and bigot. I cannot believe that the press did not know this. It simply played along to sell this falsehood of a hero and martyr. These are six leads that anyone from S.A. should be able to confirm easily with documentary proof. Mandela is a murderer and a liar. He only lived in "poverty" when it suited him. Just ask where he is presently living. There are very few Whites or other people that can, after a lifetime of working, afford the house he is living in now. Nonetheless, for some reason, I have no reason why, the media are ignoring all of this and misrepresent the actual situation. - Report sent by South African historical expert living in the United States. The ANC is part of an alliance with the SA Communist Party and the Black super-union COSATU, of which the Communists are the numerical minority, but the most influential and dominant partner. Most key positions in the ANC are occupied by SACP and ex-SACP members. 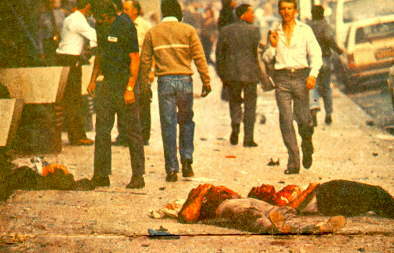 Before 1990 the ANC/Communist alliance was a terrorist organisation, which waged a relatively unsuccessful, but nasty and cowardly "war", mostly against civilians and against what was supposed to be "their" people, the Blacks, through the barbaric "necklacing" (torching a helpless victim with a burning tyre around his neck to death), bombs and assassinations. From 1990 to 1994 the last White president of SA, F.W. de Klerk, railroaded the traditional power structure of the country into accepting a staged "democratic election" in 1994, which was manipulated to bring the ANC/Communist alliance to power. By lying and cheating he kept many Whites in the dark about his real intentions. Since 1994 the ANC/Communist regime is dutifully busy destroying everything good and strong in the country in the name of "affirmative action" and "Black empowerment", while step by step suppressing the freedom of the people and nations under its heel. "Nelson R. Mandela", a Xhosa from the Transkei, got involved as a young lawyer with a bunch of White would-be terrorists with large caches of explosives and weapons in Johannesburg, who were found out and tried in a court of law (the old SA courts were still independent). Left to face the music by the White instigators, who had mostly run away overseas, Mandela got a life sentence for his involvement in terrorism, being part of the planning of attacks on installations and non-military targets and the beginning of the terrorist war mentioned above. He sat in prison for 27 years, treated as a political prisoner, regularly visited by all sorts of monitors and others, in clean, efficient prisons of the old SA (not like the new SA's hell-holes). In the early nineties de Klerk let him out to become the "nice" figurehead of the "new SA". This is just a nutshell. Quite tragic really what is happening in SA. But in the end the Whites have only themselves to blame for the gutless way they allowed the treacherous handover to happen - and the even more disgusting way many of them are now helping keep the regime in power by fawning and toadying up to the new rulers. - Report sent by Southern Cross Africa.